Guyle Fielder played 22 professional hockey seasons with mostly the Seattle Totems, posting the fourth-highest point total of all-time. A season-ticket and suites preview showroom at the Pacific Science Center planned by the city's incoming NHL franchise will honor Fielder next month with a permanent replica of his locker. 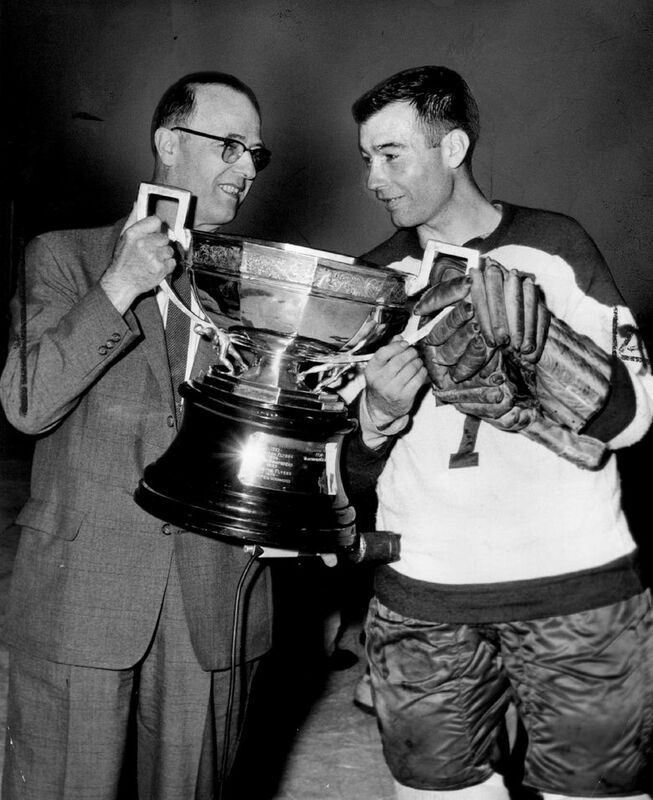 Longtime Seattle Totems legend Guyle Fielder is to be honored by this city’s incoming NHL franchise sooner than he or anyone else initially thought. Now 88 and living in Arizona, Fielder, who captained the Totems to three Western Hockey League minor professional championships in the 1950s and 1960s, had already expressed hope of attending the NHL team’s opening game at KeyArena in October 2021. But now, with the NHL Seattle season-ticket and suites preview center set to officially open in three weeks, a replica of Fielder’s former locker stall is being built as one of the attractions within the showroom. Not only that, but “Golden Guyle” himself has been invited by NHL Seattle to appear at the Pacific Science Center-based showroom. Details are being finalized, but Fielder said he’s picked out some of his Totems memorabilia – his original game jersey and a customized stick among them – to be used for the locker stall and has been told to expect to travel up here for a few days next month. Idaho-born, Saskatchewan-raised Fielder finished with 2,037 combined goals and assists for the fourth-highest point total in pro hockey history. His longtime friend, British Columbia-based lawyer Douglas Buchanan, typically handles Fielder’s business affairs and has been his go-between with NHL Seattle. “Everything is still being worked out, but they’ve told me they want him there,’’ Buchanan said. The countdown to opening the preview showroom – for now to potential buyers of luxury suites and club-level seating, with season-ticket sales starting in the fall – is part of a busy month for NHL Seattle. On Tuesday, the group holds its quarterly business meeting at which time NHL Seattle president and CEO Tod Leiweke and senior hockey adviser Dave Tippett will ask ownership for approval to hire the new team’s general manager this summer rather than next year. Interviews of candidates would begin early during the NHL playoffs and continue into June. Some potential candidates, such as Vegas Golden Knights assistant GM Kelly McCrimmon, are with playoff-bound squads and won’t be interviewed until their clubs are eliminated. Despite recent rumors, the NHL Seattle group also won’t finalize plans for an American Hockey League farm-team location until after its next quarterly business meeting in June. For now, the group’s limited opening of the preview showroom follows the one-year March 1 anniversary of it collecting nearly 33,000 season-ticket deposits from fans. That stunning tally paved the way for the NHL team’s official approval in December, though deposit holders have been kept in the dark since then about pricing and seat locations. And they’ll still be largely without those answers until the fall, attributable partly to the NHL-imposed one-year delay from the team’s initially intended 2020 franchise launch. The delay means NHL Seattle and the Oak View Group (OVG) arena developer have had to revise the envisioned price point on season-ticket packages due to inflation and other considerations. Already, the cost of completely remaking what both groups call the “New Arena at Seattle Center” has shot up by $150 million from their $700 million estimates last fall. Some of that will inevitably be recouped through season-ticket pricing once OVG gets a firmer grasp on the venue’s final cost. The vast showroom inside the ticket-preview center, with laser lights and video wall displays, will feature a motorized, high-tech model of the completed arena with its roof lifting off to provide a peek at the new features inside. Full-sized replica luxury suites for sale have also been built. Future corporate sponsors already have been taken through the showroom to view the suites, even as construction was ongoing. The Fielder locker replica is one of two planned. His will be permanent, while the other will be interchangeable and honor former NHL greats making appearances at the showroom from time to time. The showroom contains photographs and information on players and moments in Seattle’s hockey past. But Fielder will be the first former player honored in person. The new team is expected to also honor Fielder in some permanent way at the arena once it reopens. For now, Fielder, who hates flying and hasn’t been on a plane since retiring in 1973, plans to have his longtime companion, Betty, drive them up from Arizona. And begin their latest journey with a long-awaited commemoration of another that ended decades ago.